Elton John I'm a Wedding Singer Now! 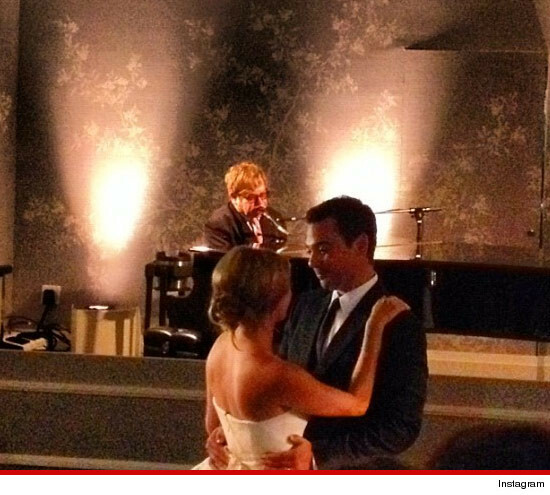 Elton John -- I'm a Wedding Singer Now! Elton John spent his weekend on the wedding circuit -- not as a guest, as a performer ... and one of the gigs was for Jeffrey Katzenberg's daughter ... TMZ has learned. John was a surprise guest as Laura Katzenberg (pictured below) got hitched to bigshot record producer Mark Sudack in Los Angeles this weekend. John took to the piano and provided the music for the couple's first dance. It's not too surprising, considering Jeffrey Katzenberg was running Disney back when Elton did the soundtrack to "The Lion King" ... and the two have been friends ever since. But the night before the Katzenberg bash ... John performed at ANOTHER huge wedding -- when actress Holly Valance tied the knot with U.K. billionaire Nick Candy at the Paramount lot in L.A.
And back in August, Elton reportedly performed at a wedding in Canada ....after the groom made a giant donation to John's AIDS foundation. Sir Elton John -- Cracked Out on a Boat!